Teachers arrive on Smith Island. Feel the wind on your face and get the mud between your toes! 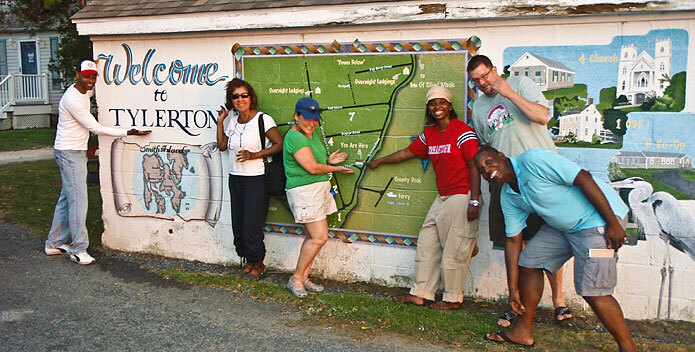 Our Smith Island Environmental Education Program in Tylerton, Maryland integrates island culture with the ecology of the Chesapeake Bay. Steeped in Chesapeake lore and heritage, Smith Island provides the ideal experience to achieve trans-disciplinary learning. Housed in two of Tylerton's original structures, this center allows participants to experience a traditional watermen's society where people's livelihoods are completely dependent on a healthy bay. The community's history, simplicity, and natural beauty make it truly unique. While using inquiry based learning techniques and S.T.E.M. practices we will explore wetlands, underwater grass beds, oyster reefs, and open bay by foot, canoe, and jet boat. Come see why we want to save the bay! Min. 20/max. 30 people (includes chaperones). Boats include 11 canoes; a 21-ft. Carolina skiff; and the Susquehanna, a 42-ft. research workboat. Bring the watershed to life as you engage your students with curriculum-based investigations before and after a field experience with CBF! All links below are for websites or Adobe pdf documents available to download.